We love pieces that will add character to a space. 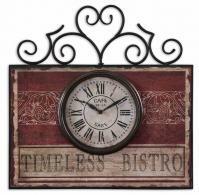 This French Country Bistro Wall Clock does just that! The unique wall plaque will add a rustic touch of whimsy to any kitchen or dining area. The wall decor clock features a distressed, aged red and antiqued ivory finish with rustic bronze hand forged metal details. For more information visit www.cheapchicdecor.com.